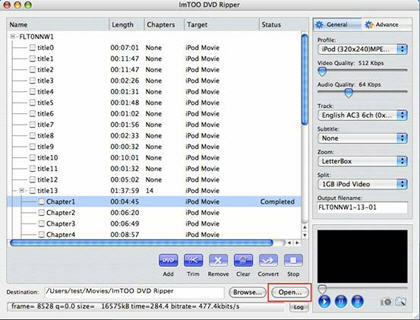 How to rip/convert DVD to 3GP2 M4A OGG AC3 AAC RA AU on Mac? How to rip/convert DVD to 3GP2 M4A OGG AC3 AAC RA AU etc. on Mac? This page will show you how to rip/convert DVD to 3GP2 M4A OGG AC3 AAC RA AU etc. 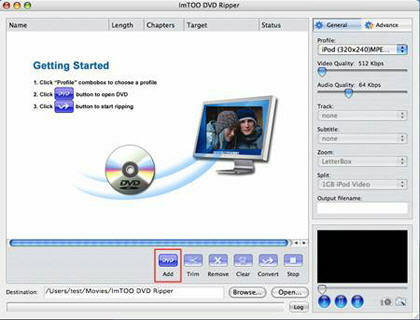 on Mac step by step with ImTOO DVD Ripper for Mac. ImTOO DVD Ripper for Mac is powerful, all-in-one DVD Ripper designed for Mac users specially. As DVD Riper, it can rip DVD to video formats like AVI, MPEG, WMV, DivX, RM, MOV, 3GP, 3GP2, MP4, MPEG4 AVC, BlackBerry 3GP, BlackBerry AVI, BlackBerry MPEG-4 Video(*.mp4), etc. As DVD Audio Ripper, it can rip DVD to audio formats like MP3, WAV, WMA, AAC, AC3, M4A, OGG, RA, AU, BlackBerry AMR Audio etc. Step1. 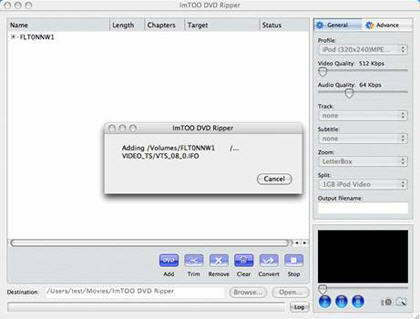 Please download ImTOO DVD Ripper for Mac and run it on your Apple computer. Insert DVD to your DVD-ROM. Run DVD Ripper for Mac, and load DVD automatically. You can also click "Add" button to load DVD disc, or DVD folder. If you want to load DVD image, you must double-click the DVD image files firstly, and then click "Add" button to load. After loading the DVD, please highlight the titles or chapters you want to rip, and then select the profile from the "Profile" combobox on the right "General" panel. 1. After choosing the profile for the selected files, you can adjust parameters by the "Advance" panel, such as "Bit Rate", "Sample Rate", "Duration", "Start time", etc. Select the file you want to view and click the "Play" button in the preview window right below. You can click the "Pause" or "Stop" button when the movie is playing. It can also help you get snapshots by the capture function easily. This function is only for previewing the source file. After everything is OK, please click the "Convert" button to start ripping. After the conversion, click the "Open" button at the bottom of the main interface to browse the output files.